The Neptune Disinfecting cage and side walls each serve a distinct purpose. 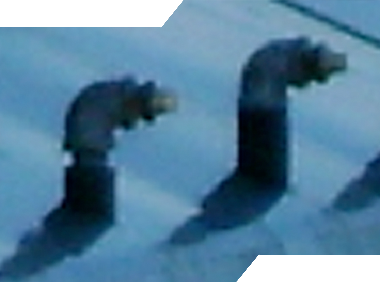 The side walls are constructed with a solid weld. 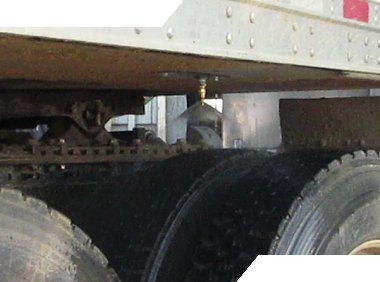 They measure 8’6” (102”) wide at the base and widen to 11’ 6” (138”) inches at the body of the truck, to allow for a wide load with extended mirrors; common transport vehicle features. For added durability, the square tubing that serves as the header system to dispense the disinfectant also serves as the framework for the Galvalum Cage. The cage sheeting is critical to prevent drift on windy days. 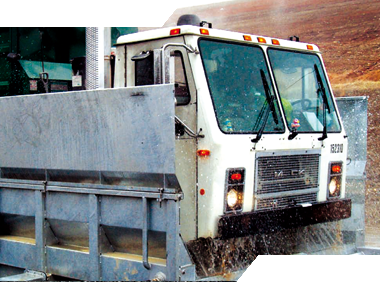 This also greatly reduces waste and prevents disinfectant exposure to nearby workers. Constructed of 3/8” hot-dip galvanized disinfecting steel, each section is 102” long x 114” wide at the wheel base. 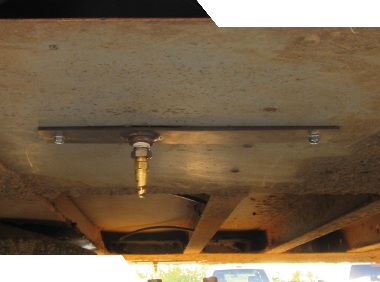 The base of the Disinfectant module is specifically designed to help the disinfectant penetrate the area of the vehicle that tends to have the highest concentrate of contaminants: the vehicle's tires. 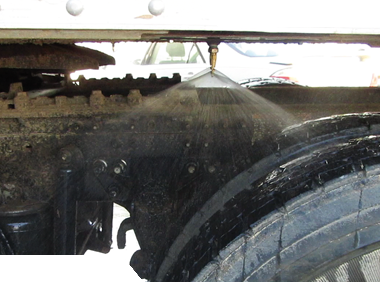 Our patented Tracinator base is designed to flex the treads of the tires, causing solids causing to drop free and allowing the disinfectant to coat the tires. To develop an interior misting pattern with no voids, it is critical to have the right position, spacing and nozzles to deliver the spray. Simply having open orifices will not create the mist pattern that is needed for effective disinfecting. The small water droplets produced by our nozzles are essential to penetrate both the crevices and smooth surfaces of the vehicle. 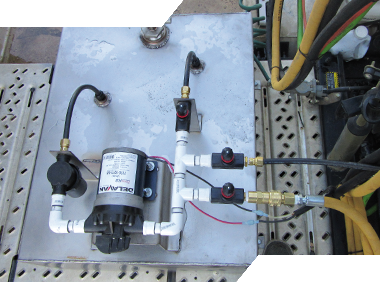 To achieve the type of pressure necessary to effectively mist and disinfect, we engineered side-spray nozzles instead of the drilled hole dispensing system often used by competing companies' spray arch units. 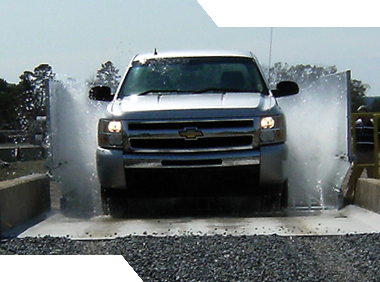 The Wash Platform consists of two wash Elements (1 left, 1 right), each one being 12 foot long with a tread width of 42”, and an overall drive width of 114”. 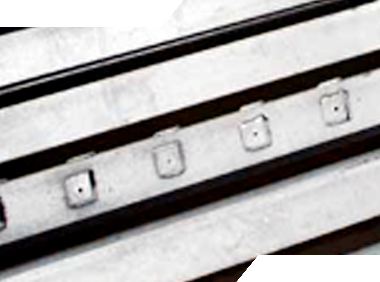 The wash element frame is constructed of 4” schedule 80 steel pipe with 3/8” bar on edge for the treads. The wash elements contain an integrated steel internal sludge and water drainage sloped steel pan for the rapid discharge of solids, debris, and water; checker plate steel center cover manufactured from 1/4” checker plate steel which locks into the wash element frame. Includes Tread Nozzles, Side Spray Bars, and Side Curtains with three piece brass spray nozzles. Integrated 3,500 gallon water recycling and solid separation tank. Self-supporting steel structure includes one (1) welded in place weir wall with mesh insert. 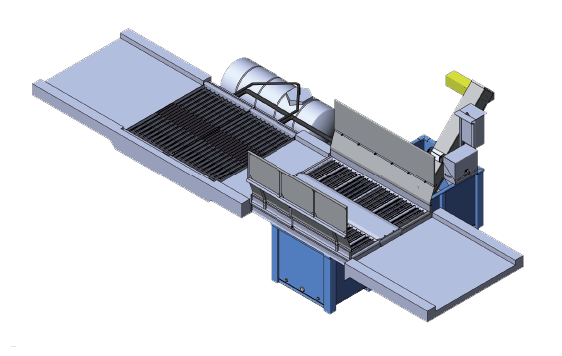 The tank is configured with an Automated Scraper Conveyor for continual removal of solids from prefabricated tank which includes paddles; motor; and discharge chute to allow the system to continually scrape the solids from the bottom of the tank, and dispose of the de-watered solids through the discharge chute. One galvanized disinfecting platform 144” long x 114” wide at the wheel base; manufactured in two pieces for each of shipping. The platform is designed to be placed at even grade with the wheel wash system. 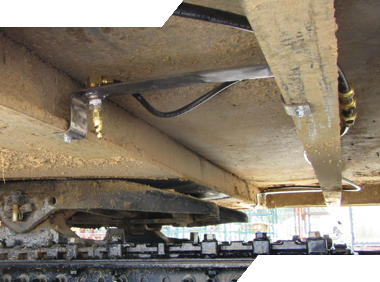 The base of the system includes integrated nozzles drilled into the wash platform. Each nozzle bar is 144” long and sprays at a 45 degree angle. 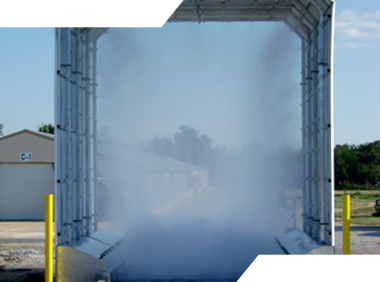 The entrance and exit spray bars are configured with low flow high pressure nozzles tips for even application. 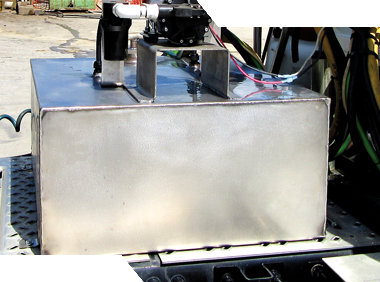 The disinfecting systems are configured with one (1) Inline Centrifugal Pump constructed with a cast iron body and stainless steel impeller, and includes a pressure regulator and by pass valve. The system is designed to be plumbed to a customer supplied vault or tank to hold a premixed disinfectant mixture.